Looking for an unique margarita? Well, look no further than Sabor Modern Mexican! Located on Royal Caribbean's Freedom of the Seas, Liberty of the Seas and Navigator of the Seas, this contemporary take on Mexican cuisine is something of a hidden gem. Word is getting around about Sabor among Royal Caribbean fans, but guests new to Royal Caribbean may not yet know about the frankly amazing food and drink at Sabor. Sabor Modern Mexican has earned itself a solid reputation for its fresh, authentic food that boasts an impressive selection of Mexican dishes across their menu (including some amazing tuna tacos), and a staff with a passion and knowledge about what they serve. When you talk about a Mexican meal, margaritas may quickly come to mind and if you have a reservation to dine at Sabor on your next Royal Caribbean cruise, then you need to need to treat yo self and indulge in their margarita list! 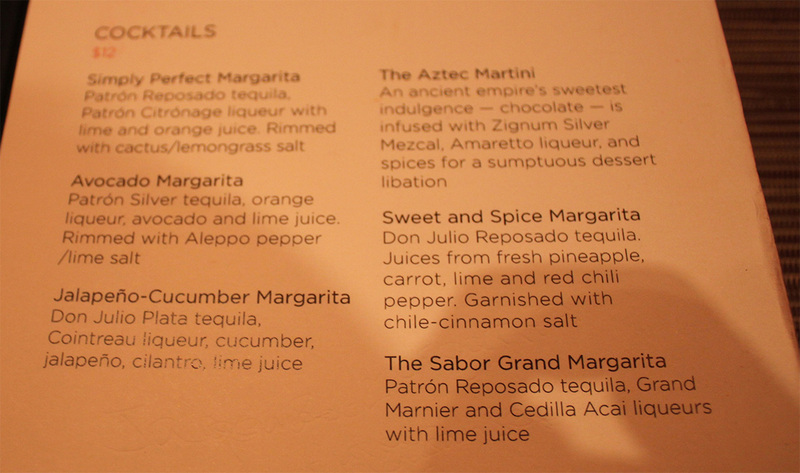 So, join me as I try the various margaritas found on the Sabor Modern Mexican menu. Once seated at Sabor for lunch or dinner, your waiter will provide you with a menu of the available margaritas. Some of the margaritas are hand crafted at your table, while the others are freshly made behind-the-scenes. Of course, for "research purposes," we have no choice but to try all the margaritas from the margarita menu. Across various Royal Caribbean ships, we have tried these great cocktails and it is easy to find a favorite. We will begin with my personal favorite, the Avocado Margarita. It is smooth, flavorful and has (a lot of) smooth Patrón tequila. The Avocado Margarita consists of Patrón Silver tequila, orange liqueur, avocado and lime juice. Rimmed with Aleppo pepper/lime salt. I dare you not to like this one. If you are more of a traditionalist, there are two good choices for you. First up, is the Sabor Grand Margarita. The Sabor Grand is great for anyone who is either new to margaritas or prefers a fruitier taste to their fine Mexican beverages. It is made of Patron Reposado tequila, Grand Marnier and Cedilla Acai liqueurs with lime juice. The Cedilla Acai is what gives this drink its red color, and also adds a pleasant flavor. The Simply Perfect Margarita is very similar, but more of a classic look and taste. With a name like Simply Perfect, there are some high expectations set and I am happy to report it does not disappoint. Unlike many conventional margaritas, there is no compromising on the tequila or flavor of the drink. Patrón Reposado tequila, Patrón Citrónage liqueur with lime and orange juice makes for a very solid beverage. If you fancy yourself a more adventurous margarita drinker, there are two margaritas that are great for you. First up is the Sweet and Spice Margarita. As the name implies, it starts off with a sweet, traditional margarita taste but once the drink passes by your lips, your mouth will be left with a little kick to it. The Sweet and Spice Margarita is definitely a different kind of drink, and perfect for anyone that wants something different from the usual kind of drinks one might get a restaurant. Different does not have a negative connotation, rather, it means there is little like this unique margarita. Speaking of spice, if you prefer a little less sweet and a little more spice, go for the Jalapeño-Cucumber Margarita. When you have bits of jalapeño floating in the drink, rest assured that this is not a wimpy drink. It is made of Don Julio Plata tequila. Cointreau liqueur, cucumber, jalapeño, cilantro, lime juice and for fans of spicy, this is the perfect margarita to compliment the food that can also be ordered spicy. A good tip is to ask your waiter to make the table side guacamole extra spicy too, and you are sure to destroy many of your taste buds by the end of the meal! You might note that we have included all of the margaritas from the menu, but we have a bonus margarita to share! While dining at Sabor Modern Mexican a third time during our cruise (I'm only human! 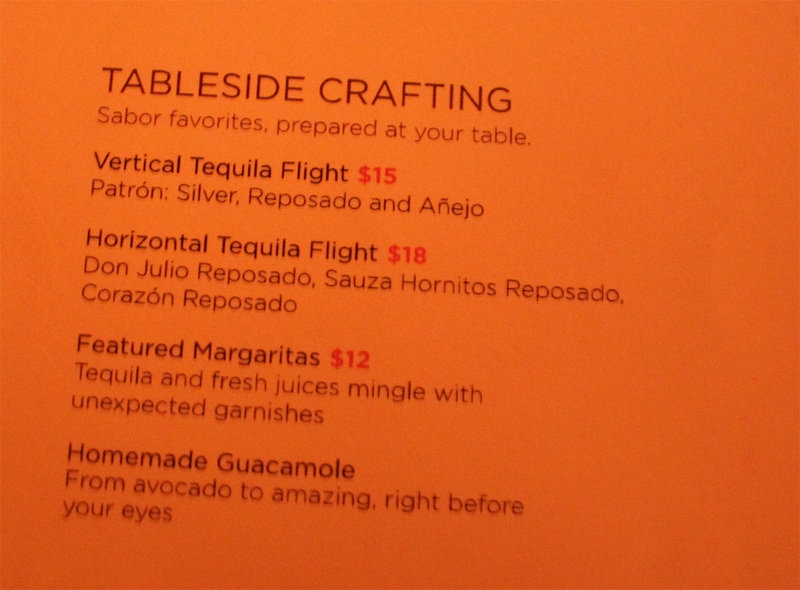 ), our waiter inquired if we wanted to try a margarita that is not listed on the menu, the Mezcal Margarita. Not being one to shy away for hard-hitting "research," I bravely ventured forth into this brave new margarita world. Our waiter explained that Mezcal is agave-based liquor. Tequila must be made from the Blue Agave. Mezcal, on the other hand, can be made from more than 30 varieties of agave, including the Blue Agave. What you need to know is that Mezcal has a smoky flavor to it, and it is unlike any other margarita on Sabor's menu. I really enjoyed it and only wish I knew about it earlier! I cannot be certain the Mezcal Margarita will be available on your sailing, but if you want something different, there is no harm in asking for it. Since Sabor Modern Mexican opened on Navigator of the Seas, the restaurant catapulted to the top of my favorites list and I look forward to seeing (and tasting) whatever come up with next! What is your favorite margarita flavor? Please let us know with a comment below!